and gab in the dining room. Funny how that happens! This year, "mother nature" gave me a huge present---70 degree weather! As I get older, I have less toleration for the winter. I dislike the snow more and more every year and absolutely despise being cold. Last night, it was so warm in my house we had to turn on the air conditioning. Yes!! Because it was so warm, I chose to wear a sleeveless chocolate brown leather dress. I haven't worn it in quite a while and actually wasn't sure if it would fit (I've got the menopause middle thing going on). But with the "sucking in" power of a good shaper, I was able to get it zipped! I paired the dress with a fabulous chunky pearl necklace from Bittersweet Designs (love their jewelry!) and black suede pumps. 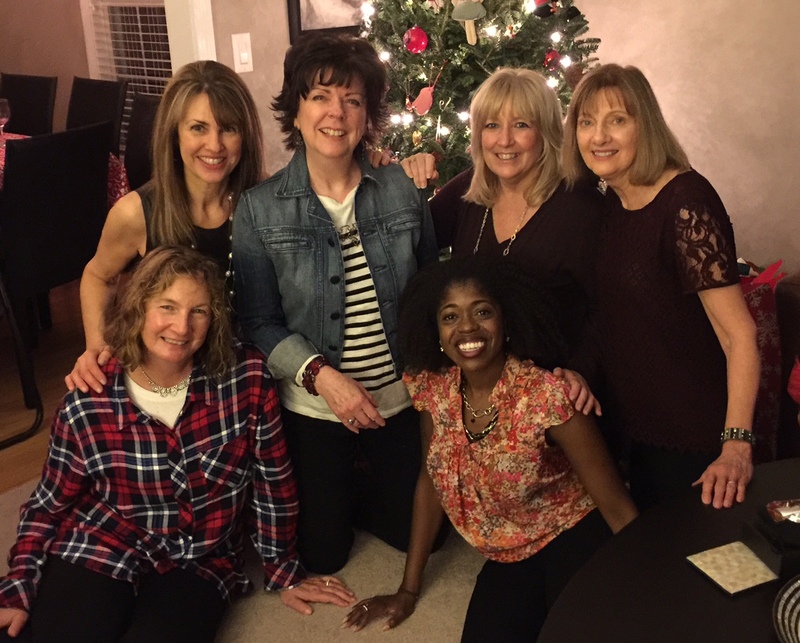 Here are some of my soul sisters who are all Christmas Eve "regulars"--from left to right Betsy (sitting), me, Fran, Cathy (my photographer! ), Diane and sitting in the front right is Dayanne Danier who is a fashion designer. Her gorgeous line is Bien Abye. Wishing you a very beautiful Christmas Day filled with love and laughter. Thank you to Bittersweet Designs for providing the beautiful necklace.